Applications for the 12th Year Anniversary “Best of Berwyn” were distributed to Berwyn schools, recreation organizations and agencies. The Best of Berwyn Junior Citizen Recognition Program is a search for the top 8th grade students within the City of Berwyn. It’s an annual program sponsored by the North Berwyn Park District to distinguish teens that have focused their attention towards family, academics and improving their community. The initial process consists of students being nominated through applications and letters of recommendation sent in by Berwyn North School District 98, Elementary School District 100, The Berwyn Library, Pav YMCA, St. Leonard School, St. Odilo School, Police Explorers, Berwyn Park District and the Berwyn Recreation Department. Nominee applications are due Monday, March 25. Beginning April 1st, the judges compiled of community leaders, teachers and public officials have the difficult task of sorting through the applications and interviewing the candidates to determine the person who best exemplifies the criteria for this program. 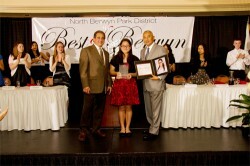 The candidates and winner will then be invited, along with their family members, to attend the “Best of Berwyn” banquet held this year on May 1st at Skylite West Banquets to celebrate their nomination.